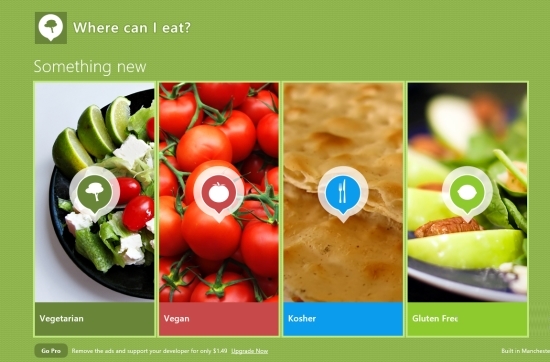 Home Apps Windows 8 Restaurant Finder App Free: Where can I eat? 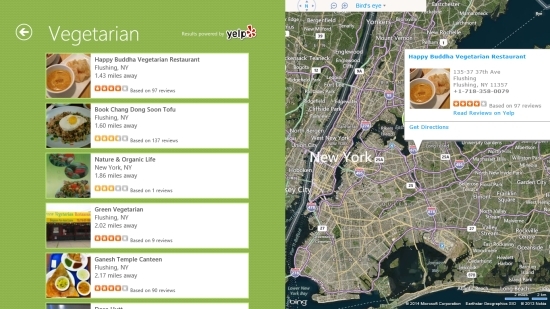 Windows 8 Restaurant Finder App Free: Where can I eat? Where can I eat? is a Windows 8 Restaurant Finder App. It can be used to find restaurants near you, or near any given location. The app provides information about the nearest Vegetarian, Vegan, Gluten free, and Kosher restaurants. It also provide the maps for reaching these restaurants. There is an option to get detailed, step by step directions to reach these places. You can also share the directions with anyone using the Windows 8 Share Charm, and read reviews given by other users about these restaurants, within the app. Where can I eat? is freely available in the Health & Fitness category of the Windows Store. Let’s get you a better idea about the app. As you get to the main page of Where can I eat?, you will be asked to allow the application to use your location. It is on the basis of your current location, that the app will provide you the restaurants. Four main options, that is, Vegetarian, Vegan, Gluten free, and Kosher will be shown to you on the main landing page of the app. They would appear as vertical tiles on the screen. You can choose any of them to find the nearby places. The app, by default, will provide you information for nearby places on the basis of your current location. In addition to this, you can also set a location by yourself, by providing the name for it. The restaurants you want to find nearby your current location would be shown on the main page, in the rightmost panel, named as Close By. If you want to search for restaurants near any other location, just choose an appropriate restaurant type from the main screen of the app. 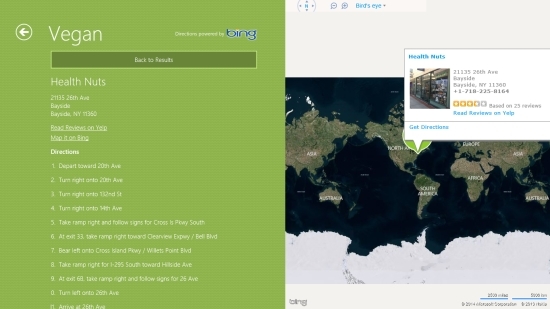 A new page will open up where you have to mention in a place name, and have to provide a radius within which the app must search. The locations will appear in a list on the left side, with a map on right side. Choose the restaurant from the list, and the app will find the place on the map for you. Get directions for the place using the requisite option, which is available in the icon of the place that appears on the map. Detailed step by step instructions will open up on the left side. You can share the directions by using the share charm of Windows 8. Also check Eatfindr and Places Near Me . Key Features of Where can I eat? Find restaurants for eating, using this app. You can also give a location to search restaurants near it. You can get directions for the restaurant which you can also share with others. According to my experience with the app, Where can I eat? 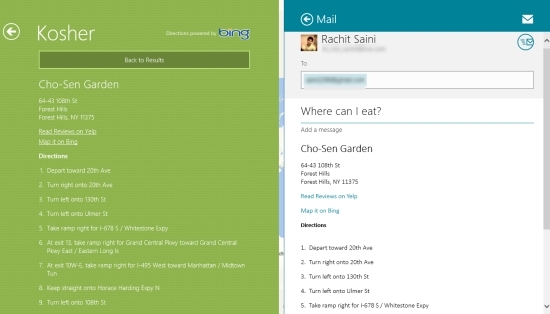 is quite a nice Windows 8 Restaurant Finder app. Give it a try for sure!